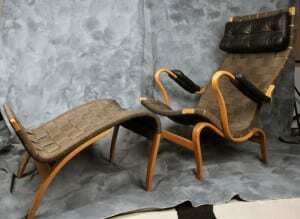 In the next few days- I was going to post the details of a set of three Bruno Mathsson mid-century modern chairs (2 Evas and one Pernilla/Miranda chaise). My parents have finally decided to declutter the cottage- and get some more practical seating. I was going to take pictures of the actual chairs- and get them ready- but, then a friend asked a favor- so this got rushed. Asking $800 each or $1,500 for the two. SOLD! Bruno Mathsson Eva chair. We have 2 for sale. The Pernilla chaise is black webbing, with the black leather head rest and arm cushions. The foot rest has one strap that’s worn, and the webbing is all faded from the sun. Here is the best picture of the style- I could find.They are asking $2500. 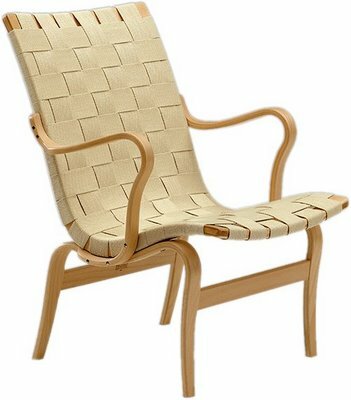 One of my readers will have some amazing examples of pristine Swedish design, with the caveat that Esrati sat here. (I’m only joking- but, yes- I sat in them a lot growing up). Then a friend is moving and asked me to spread the word about this amazing Divan- a one-of-a-kind piece she’d like to unload to someone who recognizes fine furniture. It sounds like a dessert, but the Dulce de Leche Divan by Trevor O’Neil is a contemporary sofa that’s both stylish and eco-friendly. 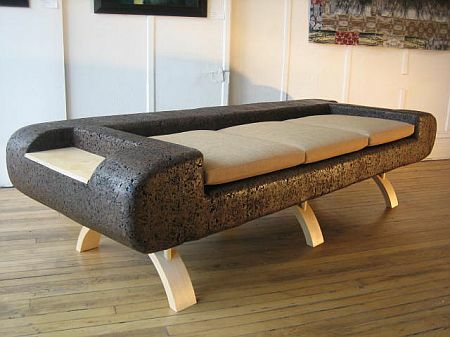 Made of recycled cork and birch, this sofa is simple and contemporary in design. Besides neutral/natural colors (it looks almost unfinished) clean lines with rounded soft edges make this an inviting seat, although with no back it’s probably not the best for real relaxing — sit up straight! Only available in the one color scheme, and notice the handy built-in end tables on either side. via Trevor O’Neil’s “Dulce de Leche Divan”. It’s the only one in existence. No imperfections whatsoever (but cork has an imperfect texture by nature). Completely hand made from cork and birch with linen seat cushions. One of a kind. I bought directly from the artist, so no previous owners. 90X36. Cushioned area is 66×24. Has end tables built into both arm rests. Was originally listed by the studio at 10K. I need $4,000 to part with it. If you are interested in the Mathssons call me at 937-228-4433 or email using the link on the top of the sidebar. They are available for viewing in Dayton, Ohio. We can ship- if you’re willing to pay. In a few weeks, I’ll put them on E-bay. For the couch- write [email protected] to get in touch. Looking over the four pieces- they’d go real well together. Just a thought. Next Post: Quality of life is economic development. Let’s organize it better. I was discussing the divan with some folks at Mainly Art in Cincy today. They have seen one-of-a-kinds like this go for as much as 25-50K when a relatively unknown artist starts to get some notoriety. I was advised to hold onto it for a couple of years and follow Trevor’s career closely because the piece could very well skyrocket in value. Unfortunately, I’m moving to the west coast and I would rather not haul it across the Rockies or leave it in a store and lock to rot. I’d like it to go to someone who really appreciates it and has a space where it can make a real visual statement. If interested, shoot me an email via the link.